Man I got it and I got it bad and I think the only cure is a World Championship trophy back in D-Town. 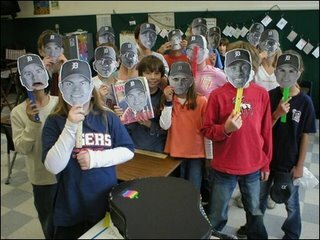 The Detroit Free Press has a bunch of great stuff for Tigers fans. They also have a download of the Olde English "K". Parties are everywhere in the D this weekend too. I have been invited to a few, but had a prior commitment to a bachelor party. This will be the first time I will be at a bachelor party where I care more about a baseball game than the entertainment. This entry was posted on October 20, 2006 at 9:22 PM. You can skip to the end and leave a response.